March 1st, 20014 was a tragic day for the Ukrainian city of Kharkiv and for all of Ukraine. 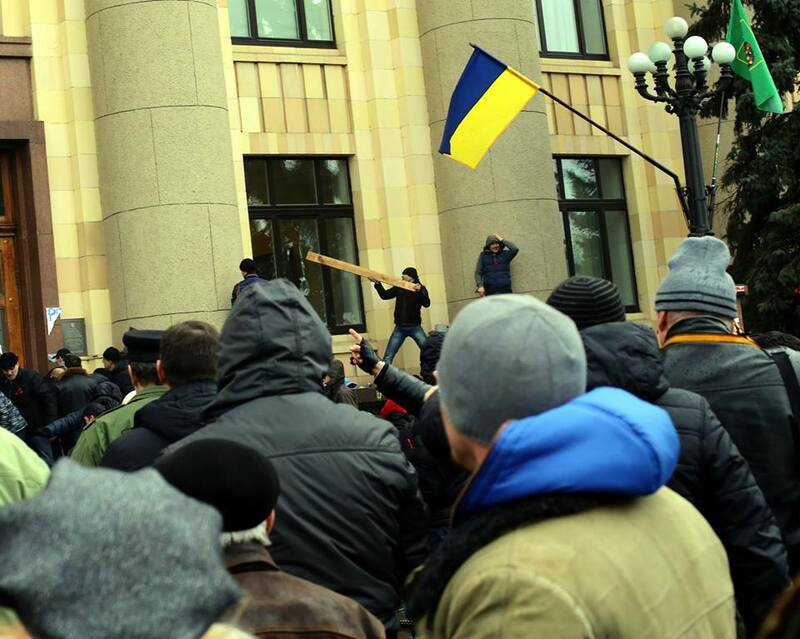 At approximately 14:20 local time a legion of several thousand people carrying Russian flags attacked the Kharkiv Region Administrative Building where a group of civic self-defense activists of Kharkiv were staying since February, 22. The young defenders, some under 18 years old: students, doctors and football fans, were brutally beaten and publicly humiliated in front of the crowd of exultant people who were sure that they had overcome dangerous “extremists” and “terrorists” from Western Ukraine, “invaders” in the Eastern city of Kharkiv. 130 people were gravely injured, some disappeared. 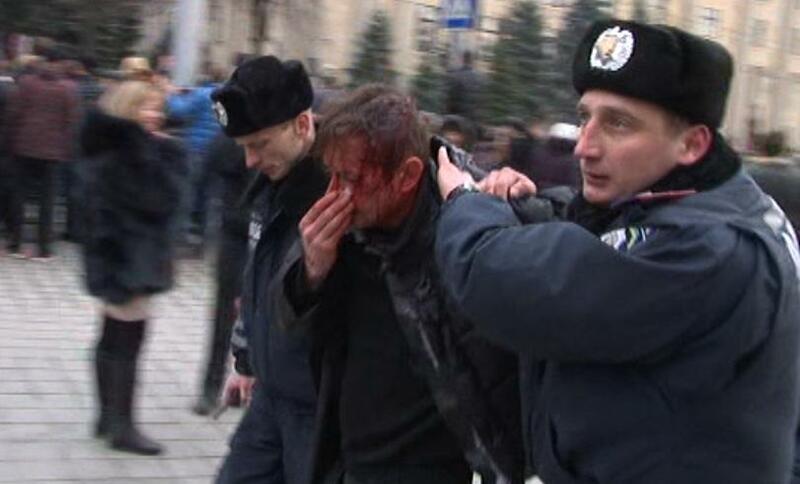 A famous Ukrainian poet Sergey Zhadan suffered a concussion, he was covered in blood when found and saved by the local police. 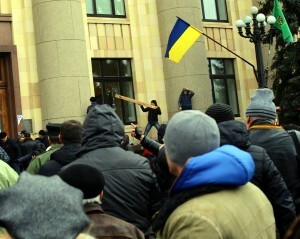 Furthermore, the State Flag of Russia was placed on the Kharkiv Region Administrative Building after capturing the activists. Similar incidents, where the flag of Russian Federation was installed on the Ukrainian state buildings, were reported on the same day in several other Ukrainian cities – Mariupol, Zaporozhie, Donetsk, Lugansk, Nikolayev. “They are not from Kharkiv, they are from Western Ukraine. 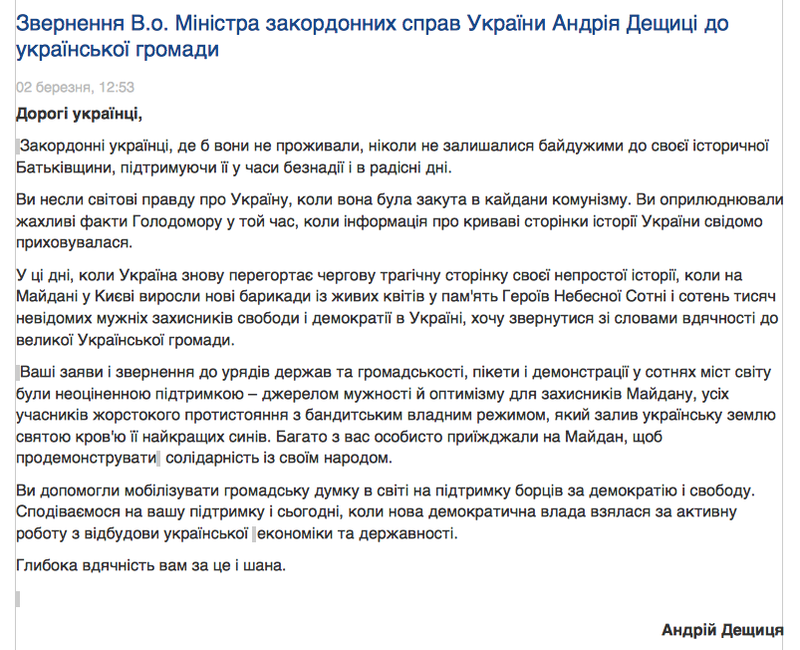 They must be punished”, – said a Kharkiv local who came to the Svoboda square and watched the sadistic punishment. Unverified (believed by many to be “purposefully deceptive”) information about “western terrorist” or “banderas” has been broadcast by Kharkiv TV channels (allegedly controlled by Russia supporters), via social media and specifically by city major Gennady Kernes during all of the EuroMaidan period. One day prior to March 1st Kharkiv beatings, Mr. Kernes called the city residents to gather on city’s central Svoboda square “to demonstrate their civil attitude to the radical invaders and to protect the city”. Next day, the rally of ten thousand frightened and aggressive people evolved into a bloody slaughter, turning against the group of young local activists believed to be from the Western Ukraine. People here believe mass-media and city authorities, nobody had pity for beaten “terrorists”. The lynching mob was spitting on the victims, racking them and enjoying the view of their suffering. Videos are below. The myths about Western gunmen who threaten the peaceful cities of East are spread all over Russian mass media channels and on most of state channels of Kharkiv since 2012 and during all EuroMaidan period of winter 2013-2014. The broadcast conspiracy theories promote information that is frightening to most people, while telling fake news from facts remains a challenge to even professional journalists. As a result, the vast part of the population truly believes that somebody is going to conquer them and they are ready to ask Russia to protect them from the “banderas”. This video is the result of the real Putin informational war to inflame aggression, hatred and civil war among the Ukrainian people. And it is victorious. The war is not limited solely to the infomedia space. The bloody Kharkiv events of March 1st, 2014, referred to as “Russian Spring” in Russian Nazi networks, may be linked to the two thousand of athletic-looking male Russian citizens who reportedly arrived to Kharkiv from the Russian city of Belgorod in the morning on the day of the clashes. Posted online are videos of nearly 50 buses with Russian license plates in Kharkiv streets. The apparently coordinated installations of the Russian flags on the State Buildings in several other Ukrainian cities show that the action of “asking Russia for protection” against some horrible radical terrorists “banderas” was thoroughly planned. The emotions of happy people taunting the helpless victims remind the viewers of sadistic entertainment of fascist Nazi. Not to mention, the idea to protect “Russian representatives suffering from other nations in other countries” is taken directly from Adolf Hitler who needed a noble excuse to commit invasion. This informational and aggressive war is a powerful and uncontrollable danger for all of the world. Fantastic goods from you, man. I have take into accout your stuff previous to and you’re simply extremely wonderful. I actually like what you have obtained here, certainly like what you’re stating and the best way during which you assert it. You make it entertaining and you still care for to stay it sensible. I cant wait to learn far more from you. That is really a tremendous website. Pretty part of content. I just stumbled upon your website and in accession capital to claim that I get actually loved account your blog posts. Anyway I will be subscribing on your augment or even I fulfillment you get admission to consistently quickly. Thank you for any other great article. Where else may anybody get that kind of information in such a perfect method of writing? I’ve a presentation subsequent week, and I am at the search for such info. Thank you for the auspicious writeup. It if truth be told was a amusement account it. Glance advanced to more introduced agreeable from you! However, how can we keep in touch? Somebody essentially assist to make severely posts I’d state. That is the very first time I frequented your website page and up to now? I amazed with the analysis you made to create this particular post extraordinary. Fantastic task! My brother recommended I might like this website. He was once entirely right. This put up actually made my day. You cann’t imagine simply how much time I had spent for this information! Thank you! Fantastic points altogether, you just won a new reader. What might you suggest about your publish that you made some days ago? Any certain?